Mobutu Sese Seko Nkuku Ngbendu Nintendo Klatu Verata Nikto Ali Ababwa Manga wa za Banga, (or Mo'booty for short), a name which means, "The all-powerful warrior who, through his ridiculous hat and glasses, goes from conquest to conquest leaving embittered starving Africans in his wake," was the leader of the African nation now known as the Democratic Republic of the Congo for 37 years, or the lifetimes of 6 average Congolese. During that time, he earned the reputation of being one of the most benevolent leaders in all of Africa, although given that his competition mostly consisted of pirates, warlords, terrorists and genocidal dictators this isn't much of an accomplishment. Today, the Congo remembers him as the man who proved you can start with nothing and somehow make it even worse, a tradition of Congolese government which continues to this day. Mobutu was born sometime in the early 1900s in the godforsaken cesspool of death and Belgians that was the Congo Free State. The exact time and place are not known as the only source on Mobutu's childhood is his autobiography, which claims that Mobutu was born in the skies at the beginning of time along with the sun and Kim Jong Il. What is known is that Mobutu was one of perhaps a dozen Africans to survive Belgian colonization, a testament to his strength and resolve. Mobutu found from a young age that he had a particular affection for leopards. Their name reminded him of Belgian King Leopold II, who he believed to be a model leader for the Congo. King Leopold's love of African culture, which led him to become a collector of African children's hands, as well as the stunning success of his revolutionary "steal-and-kill-everybody" method of governance, greatly influenced Mobutu's early thinking. Leopold's style of leadership would inspire much of Mobutu's own reign. Little is known of Mobutu's family. According to Mobutu's account, his father was the most virile chieftain in all of Africa (until Mobutu came along of course), and his mother was the most beautiful of his hundreds of wives. Although impossible to confirm, it is believed that Mobutu's father sired the entire population of the Congo. 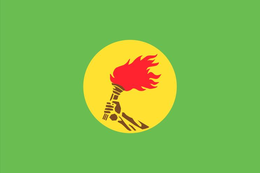 The flag Mobutu designed for Zaire, representing the angry mob he anticipated would overthrow him one day. During the 1950s, the Belgians believed that their reign over the Congo might last at least a hundred years more, at which point it would be ready for independence. Of course, every other colonial power in Africa knew that notion was bogus and were getting ready to withdraw from Africa by the mid-1960s. Belgium, realizing rather belatedly that the Congolese population was expecting the same thing and possessed large quantities of guns and machetes, panicked and started preparing to pull out. Realizing that they hadn't bothered to educate any of their population and had no real government framework in place, they instead threw their things into an airplane and hurried home to Brussels, leaving the newly founded Republic of the Congo (not to be confused with the similarly named "Republic of the Congo") to invent a functioning government for itself. After 20 minutes of puzzled head-scratching, the entire country erupted into civil war, partly on account of the Belgians' complete lack of planning but also because "all the other African countries were doing it." Mobutu made his way into the epicenter of the conflict during this time, because he was OCD and only felt comfortable being in places where he felt like he could die at any moment. Unfortunately for him, the Congolese people weren't quite as keen on living in perpetual terror and were desperate for a strongman leader insane enough to unite the country under one government. And upon finding a bespectacled man in an outrageous outfit suddenly in their midst, they knew they had their dream leader. It was finally in 1965 that Mobutu was offered to become the Congo's first president. Mobutu accepted the post, reasoning that if he ruled poorly enough he could still live in constant fear of death from his enemies. The people's hopes of a stable and prosperous future were confirmed during Mobutu's inaugural speech. Peace came to the Congo soon thereafter, mostly because all the warlords were now too dumbfounded at this strange man who was suddenly their leader to kill each other. Finding that the warlording business was now no longer lucrative, they packed up and looked for opportunity elsewhere in Africa, leaving the Congo warlord-free. Mobutu affirmed his love of money by placing his portrait on every zaïre. He would have preferred to have himself pictured on a currency worth more than toilet paper but most developed countries had reservations about putting a foreign dictator on their money. Mobutu began his rule by renaming the country Zaire, which means "Land which eventually will no longer be called Zaire" in Lingala. He then opened the "Mobutu Good Will Fund", a humanitarian organization dedicated to ending poverty everywhere. To celebrate the occasion, he drove down the streets of Zaire's capital city of Kinshasa, throwing money to all the poor he encountered, which entailed everybody in the country except himself. In addition, he declared that Zaire would be a free democracy and that he would hold an election the very next year. All candidates would belong of course to his new party, the MPR (Mobutu's Posse, fo' Real), but it would be okay since the party had no political platform whatsoever and so would be a free-for-all. The Zairians were thrilled to be finding their leader to be as benevolent as he was. Mobutu was famous for supplying free food to the starving people of Zaire. That honeymoon period was short-lived. Before long, it turned out that the Mobutu Good Will Fund officially listed Mobutu as the only person in the world, so all of the proceeds went to him by default. Also, all the coins he had thrown to the people turned out to be Chuck E. Cheese tokens, which were only valid in North Carolina before 1932. As for the elections, anybody who tried running against Mobutu and the MPR ended up receiving the same treatment as his former opponent Patrice Lumumba. It quickly became obvious to the people of Zaire that their oddly dressed megalomaniac overlord wasn't the fatherly leader they had expected. Mobutu was nonetheless able to stay in power much longer than most of his fellow evil leaders, and during that time, he became so wealthy stealing from his country that he bought the neighboring country of Rwanda, and, just to have a little fun, assigned the people roles of Hutu or Tutsi. He didn't realize how seriously they would end up taking it, but then again, did he really care? One of Mobutu's proudest projects was "authenticité", which was carried out with the aim of making Zaire more authentically African. As such, Mobutu ordered the economy to fall into disrepair and famine and disease to take hold across the country, and encouraged his citizens to start killing each other for no reason. It was a resounding success and remains his greatest legacy to the modern-day Congo. The scheme also involved changing all names from European to African ones, which was likely an excuse for him to get rid of his fruity French name, and declared the national uniform to be the "abacost", a fugly Nehru ripoff with no authentic African character whatsoever. Wearing Western-style suits was illegal, and enforcement was strict: any man caught wearing a necktie had his balls tie promptly snipped off by policemen with hedge clippers. As much as 90% of the already-nonexistent police budget went to this purpose, which was enough of a waste of money even before one considered how nobody in Zaire owned neckties anyway. Still, it was an issue of deep importance to Mobutu, who continued to see neckties as the greatest threat to Zaire's security and cultural integrity throughout his rule. 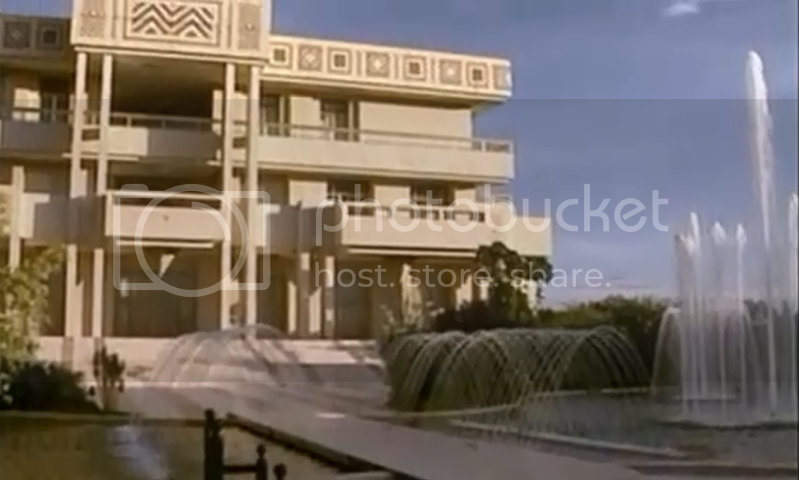 Over time, as he began to realize that his people probably hated him on account of his ruining their lives, Mobutu spent less time in the capital running the country and more time relaxing at his obscenely lavish mansion that he had built in the middle of buttfuck nowhere, where nobody could kill him or see that his multibillion-dollar marble luxury palace looked like a tourist hotel. After 37 long years, the Zairian people decided that they were fed up with their leader, realizing that being oppressed, starved and deprived of any future wasn't as fun as they had hoped. It was in this that the seeds of revolution were sown. Mobutu didn't actually need to wear glasses! He had perfect vision but wore prescription glasses so that all the misery and suffering everywhere around him would be too blurry to make out. 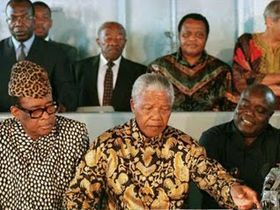 A senile Mobutu and self-confident Kabila at a conference, with Nelson Mandela meditating. As can be seen, Mandela really needs a drink. By the mid-90s, Mobutu found himself completely without friends. The end of the Cold War had prompted the United States and Europe to have as little to do with Mobutu as possible (as opposed to giving him millions of dollars), his people were disillusioned and angry, and every country in Africa was embarrassed to be on the same continent as he was. But Mobutu, who was confident but mostly just insane, knew that no matter how many armies came for his head he would be able to count on Zaire's armed forces to keep him safe. To boost morale in the ranks, Mobutu doubled the soldiers' salary to $0.04 a month and revoked all laws preventing them from killing and stealing from whoever they wanted. Meanwhile, in the Great Lakes region in the east of the country, a massive rebel movement was beginning to form, which was heavily backed by the armed forces of countries much wealthier and more successful than Zaire, such as Rwanda and Uganda, and was led by a man named Laurent Kabila, who was chosen for no reason other than that he was Africa's only fat person and therefore must be doing something right. Mobutu couldn't fathom why all his neighboring countries seemed to hate him so much, until he remembered that Zaire was harboring anti-government factions from virtually every country on Earth. He then remembered about how much money doing that was making him and, satisfied, went back to doing absolutely nothing about the situation. 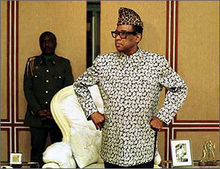 Mobutu, wondering where he left his Swiss bank account number. Finally, in 1997, rebel forces began their march across the vast center of Zaire. 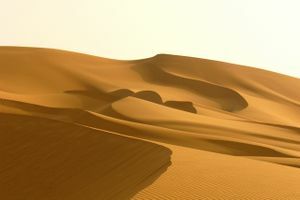 Immediately, the courage and discipline of the Zairian army was made apparent as the soldiers bravely torched every town they encountered in the process of fleeing the oncoming insurgents. In fact, the rebel forces never had to fire a single shot during their entire march, as Zaire's army was running away too fast and all the locals were already dead by the time they came through. After several weeks of intense running, rebel forces finally descended on Kinshasa. Finding they had nowhere else to flee to, Zaire's cornered army started looting every building they could in the hope they could pay air fare to France. Mobutu, in a valiant show of his undying love for his country, left it behind forever with billions of dollars he stole from it. Since then, Zaire has been the site of an unending war which has killed millions of people and dragged in every country bordering it, all the while being run by leaders just as evil and far less fashionable than the last, altogether making it one of Africa's brightest and most cooperative periods. Meanwhile, Mobutu was discovering in exile that even he couldn't flee or bribe prostate cancer, which had been affecting him for quite some time but which he hadn't had bothered to notice as he had been distracted instead by the hordes of armed men coming to kill him. Although it was clear Mobutu wouldn't live much longer, world leaders preemptively announced that Mobutu would be allowed to remain in golden exile without going to trial or learning a lesson of any kind. Following his death, it was found that Mobutu hadn't written a will, as his own propaganda had convinced him that he would live forever and that a will would be unnecessary. As such, all of Mobutu's wealth - luxury cars, jets, villas and billions of dollars shoved in a Swiss bank somewhere - now belongs to nobody. And, perhaps, that's just how Mobutu would have wanted it. For those without comedic tastes, the so-called experts at Wikipedia have an article about Mobutu Sese Seko. ↑ Also variously known as Zaire, The Congo Republic, Congo-Kinshasa, Congo-Leopoldville, the Belgian Congo, the Congo Free State, but mostly as "That place where everybody always dies." ↑ Leopold II made himself one of the richest men in the world by violently forcing millions of Congolese to harvest rubber without pay and killed off a massive proportion of the Congo's population in less than 25 years, an accomplishment which earned him a giant plaque on the Belgian Palace of Justice. ↑ A common rationale among African leaders. 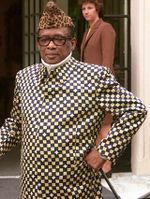 ↑ Mobutu showed his hatred of European culture and suits by designing a suit with a French name about getting rid of suits. Makes sense to me. ↑ Renamed once again to "Democratic Republic of the Congo", since things were so much simpler with two Congos instead of one. What's that? You don't agree with His Excellency, President for Life Robert Mugabe's official policies? You're trying to undermine Zimbabwe and her precious democracy, aren't you? TRAITORS TO THE REVOLUTION! WHITE IMPERIALIST PIGS! GUARDS, GET 'EM!!! This page was last edited on 15 December 2014, at 08:33.